I’m sharing the five steps that I use to help clients do major closet clean-outs. Use the free closet cleanout printable to turn a chaotic closet into your organized oasis. I absolutely LOVE working with closets - if you couldn’t already tell by the name. Even in the most beautiful homes, closets can easily become a shoving place - an easy way to hide the clutter. Today we’re focusing on my favorite closet of all - the master closet! This is the closet that you see on a daily basis, so it should be a place where you feel relaxed & at home. 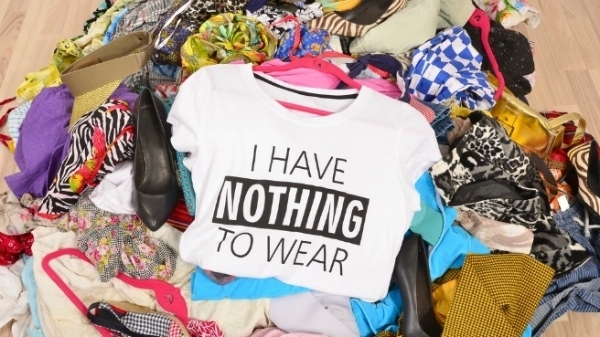 You’re probably here because your closet has gotten a little out of control. Below are the five steps that you can use to work your way towards the closet that you deserve! Yes, everything! Taking everything out of your closet will not only be a wake up call to realizing how much STUFF is really in there, but you may even give yourself a little present by finding things tucked in corners that you forgot you had! Sorting by color within categories will allow you to easily see the gaps in your wardrobe, as well as the issues. You may think you need 10 different white lace tops, but I promise that you don’t. Cleaning out your closet can be a daunting task, especially when it’s been a bit too long since the last great clothing purge. You may be tempted to try every single thing on, but then you may be working on this for days instead of hours. Be realistic about what items make you feel beautiful and which are just taking up precious space. Get rid of the items you set aside as soon as possible. You can donate everything to a local thrift store, or you could drop off items at a local consignment. If you’re going to take the time to sell them personally, make sure that they’re worth your time and effort - and don’t put it off, or you’ll just end up with yet another pile of [stuff] you don’t. After you’ve done all that hard work, take the time to put items back purposefully. The clothes that are left should be the ones that you truly love, so let’s treat them with some respect! Use the vertical space in your closet for any out of season items or things that you need to get off the floor. For more detailed action steps, download the free Closet Cleanout 101 printable. Use the self-guided checklist to hold yourself accountable, and don’t forget to share your progress with me! Warning: This guide includes a bit of organizer sassiness, so prepare yourself accordingly. Thanks for visiting Minimized! If you'd like more closet tips & inspiration, follow on Instagram, Facebook, or Pinterest @getminimized.